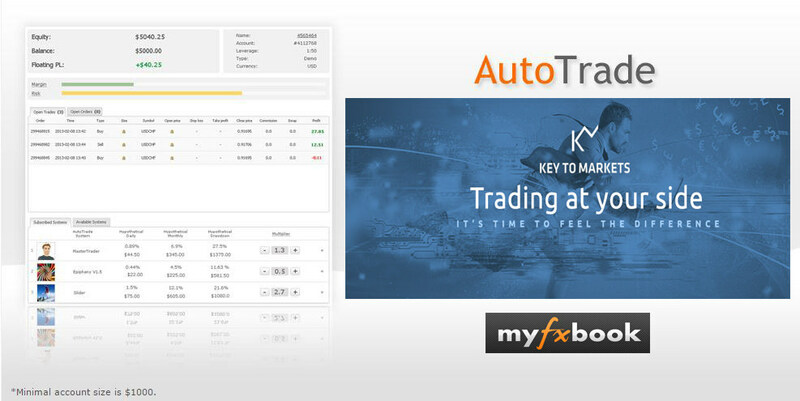 Key to Markets offer to its clients the opportunity to run the Myfxbook AutoTrade system. By choosing the AutoTrade Account you will be able to link your MT4 trading account to the trading system of your choice. Myfxbook AutoTrade allows you to create your own portfolio by following successful traders for free without paying any performance fee or management fees. Why choosing the Myfxbook AutoTrade? How to Activate the Myfxbook AutoTrade? 1. Create a live account with Key To Markets. Open a live trading account by chosing the account type "Myfxbook"
Open an additional account by chosing the account type "Myfxbook"
2. Connect your trading account with Myfxbook.